On Friday, February 22, a sold out crowd attended the Albuquerque Business First’s (formerly New MexicoBusiness Weekly) Women of Influence event at the Sandia Resort Casino. Over four-hundred nominations were received and thirty-two women were selected and honored for their contributions to the community. Among the honorees were Interim Dean Barbara Bergman and UNM School of Law alumnae Kristie Bair and Virginia Dugan. Interim Dean Bergman was selected as the winner in the Education category. In her acceptance speech, she stated that her award would not be possible without the amazing faculty, staff and students of the Law School. Ms. Dugan is a 1995 graduate of the UNM School of Law. She teaches family law as an adjunct professor at the UNM School of Law and is one of the preeminent family law attorneys in the state with Atkinson & Kelsey, P.A. She was nominated in the business category. 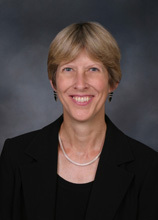 Ms. Bair is a 1994 graduate of the UNM School of Law. She is the founder and President of Bair Medical Spa and is an active member of the community. She was nominated in the health/fitness category. The UNM School of Law Alumni/ae Association was a sponsor at the event, and members of the faculty and the Alumni/ae Association were present in support of Interim Dean Bergman and our two alumnae. Congratulations to Dean Bergman, Ms. Bair and Ms. Dugan for this prestigious honor.